Toomebridge rider Michael Laverty took victory for the Tyco TAS BMW team in the first race of this season's British Superbike Championship at Silverstone. The 34-year-old assumed the lead on the first lap and held off the challenge of Ducati-mounted Shane Byrne to secure his ninth career win in the series. Laverty was sixth in race two and lies second overall, behind leader Byrne. 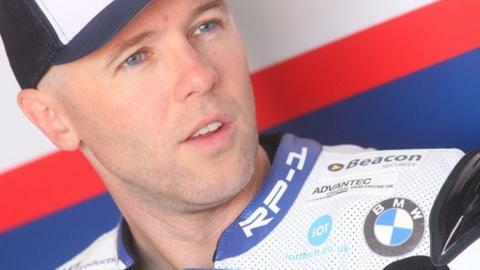 Andy Reid won the British Supersport 600 race and Josh Elliott was second in the British Superstock 1000cc event. Fermanagh rider Elliott, who is defending the title he won last season, overtook fellow Tyco BMW rider Ian Hutchinson on the final lap to clinch runner-up spot. The race was won by Scotsman Taylor Mackenzie, with another former champion, Clogher's Keith Farmer, in sixth position. Jordanstown man Reid was making his first appearance for the Quattro Plant Kawasaki team and competing for the first time since suffering a fractured wrist at Oulton Park last August. Another Northern Ireland competitor, Andrew Irwin, led during the early stages of the Supersport outing but retired on the fifth lap of 12. Laverty has finished in fourth place in the British Superbike standings in 2010, 2011 and 2015 and is in his second season with his Moneymore-based team, run by Hector and Philip Neill. "It is difficult to just run out front and look at your lap timer. I only looked at my pitboard once as I just wanted to concentrate on being as smooth as I could and not making any mistakes and the toughest thing was mid-race as my hands went a bit numb," said Laverty following his race win. "I didn't feel as comfortable as I wanted to be and I was losing time in a few areas and then I pushed on and it was enough to bring it home." Laverty was battling for the lead with eventual race two winner Peter Hickman, but fell back to sixth, and has 35 points, with series leader Byrne on 40, thanks to two runner-up positions. Laverty's Tyco BMW team-mate Christian Iddon was third in both events, while Glenn Irwin was 14th and 13th, with his fellow Carrickfergus man Alastair Seeley 14th in the second outing after failing to finish the first. The next round of the championships will be held at Oulton Park on 2 May.